School has already started down here in South Florida, but it still feels a lot like summertime. I mean, it's a hundred degrees on the regular and there is nothing that feels quite as amazing as jumping in the pool after a day of running around and sweating at the park. 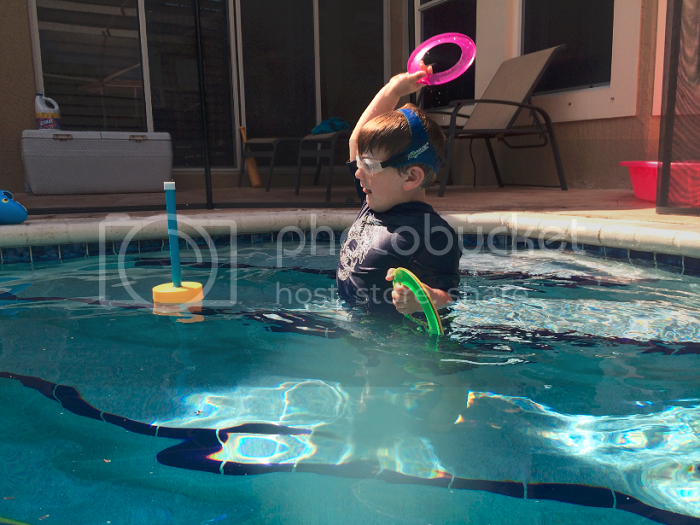 Ethan and I recently had the opportunity to work with Swim Outlet and have been having a blast enjoying our new pool goodies underneath the hot Florida sun after our preschool day ends. 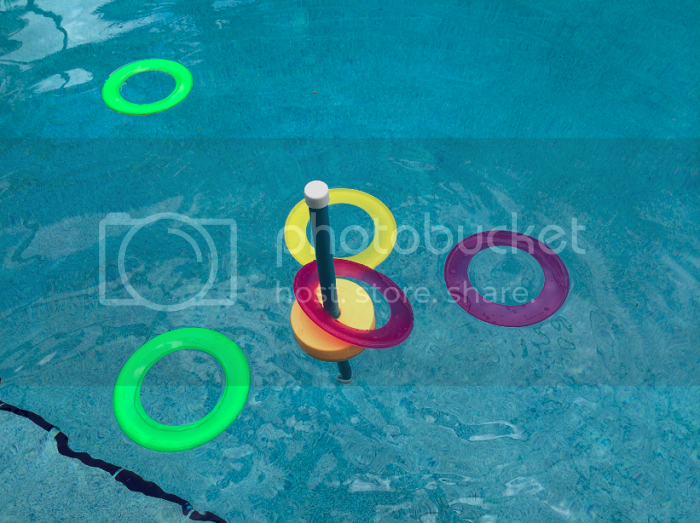 The Swimline Floating Ring Toss Game was an instant favorite. Despite all of the pieces, it's super portable. It comes apart to fit perfectly in our pool bag so that we can tote it around with us and break it out whenever we're meeting up with friends to swim. It's the perfect pool game! 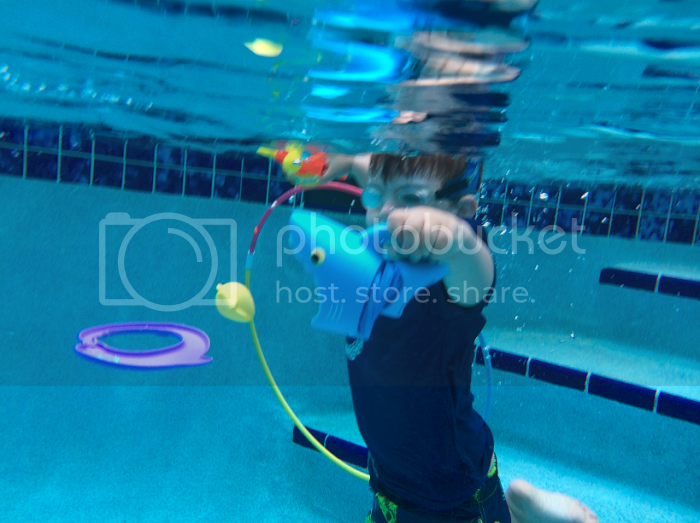 The Swimline Slalom Hoops Swim Course was one of the items Ethan was most excited about. He has mastered diving to the bottom of the pool but it still trying to accomplish swimming along the bottom. These hoops made it fun for him to keep trying -- although we have more work to do! 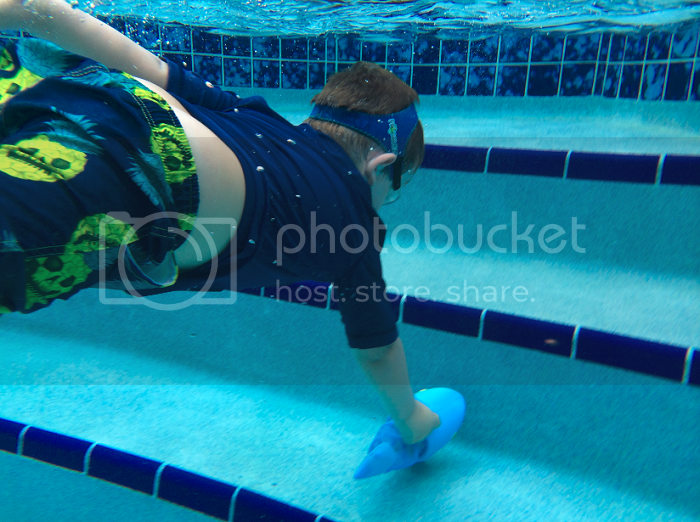 We began by placing the hoops on the bottom step, which was the perfect depth for Ethan to practice swimming through. For older children, these hoops can be set up anyway you like to make a swim course that is a lot of fun (and great exercise!) to swim through. The little Maritime Mates Soak and Seek shark by Melissa & Doug is a cuddly, easy-to-throw toy that is perfect for the pool. 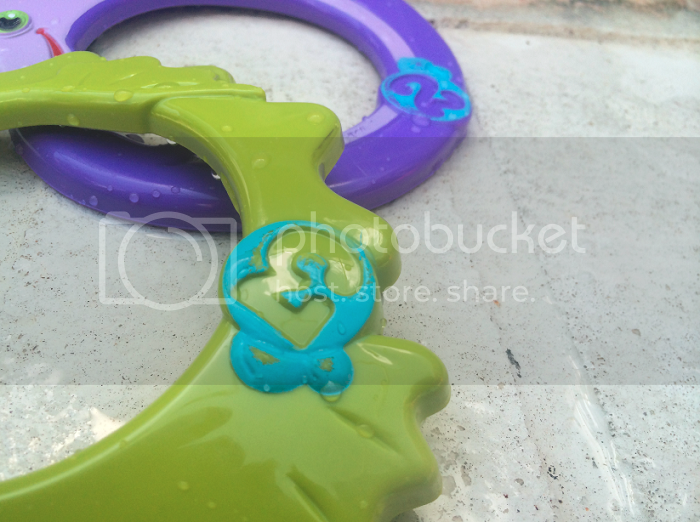 It's lightweight and dries quickly, as opposed to plastic toys that tend to fill with water. Melissa & Doug's Spark Shark Fish Hunt is another product that tops Ethan's favorites list. 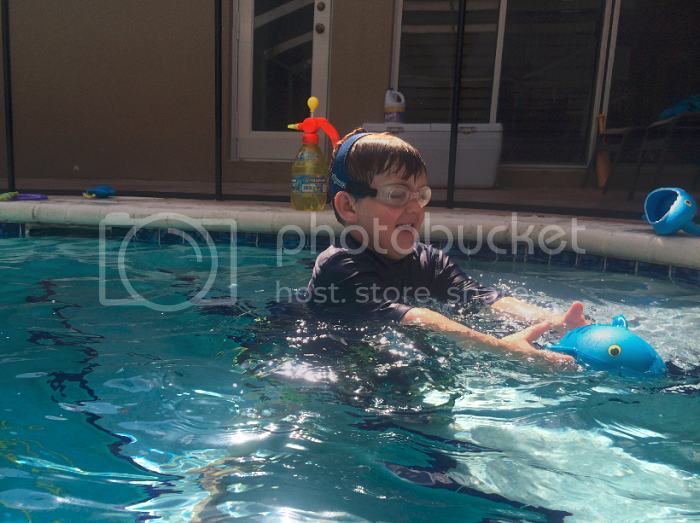 This shark game comes with two sharks, making it the perfect game for Ethan and a friend to play in the pool. 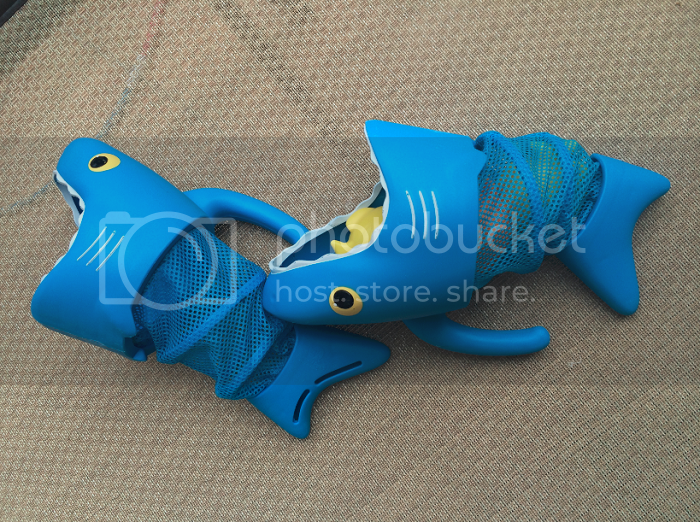 Each shark comes with three plastic, weighted fish -- yellow and orange -- that slowly fill with water so it appears they're "swimming" through the water until they sink. 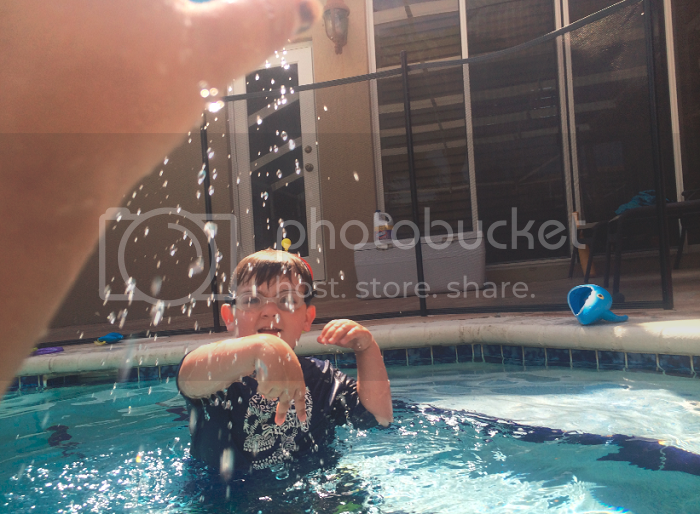 It's a fun game that really got Ethan swimming to try to catch the fish before they hit the bottom! 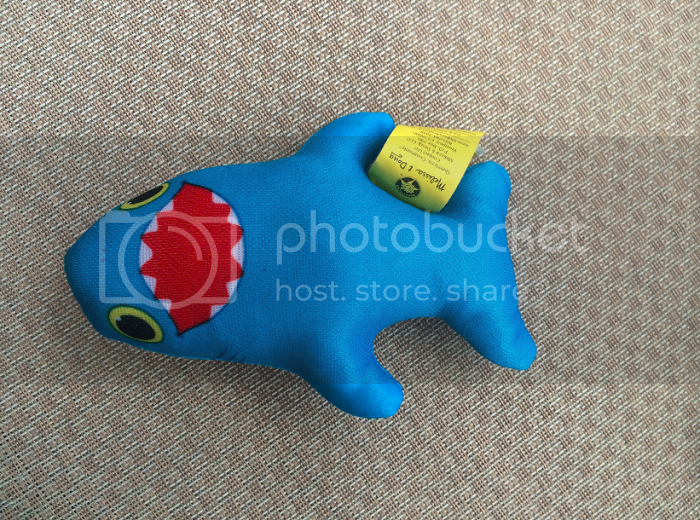 He's also brought this one in the bathtub with him a couple of times -- hey, it's fun! Ethan loves diving to the bottom of the pool and I love how these Maritime Mates Sink and Seek Rings by Melissa and Doug have numbers on them, making "earning points" another fun part of the dive-and-seek game. We also had a blast with the Melissa & Doug Spark Shark Football. This is a plush, lightweight football that fills up with water. It dries quickly and is easy to tote around in a swim bag. This football is perfect for a trip to the public city pool where Ethan and his pals can play catch without worrying about anyone getting hurt or hit with a heavy ball. And, as Ethan will happily point out, the best part of this football is that it soaks you when you catch it! For those of you who are actually getting to experience some hints of fall, Swim Outlet isn't limited to pool and beach toys. Their back to school page offers apparel, shoes, accessories, backpacks and other back-to-school necessities to get your kiddo's school year off to a great start. Swim Outlet offers products from (all of my favorite) brands such as Roxy, Billabong, O'Neill, Fox, Sanuk, Quiksilver and more. Cardigans to flip-flops to ruck sacks to belts to snapbacks, Swim Outlet has you covered. 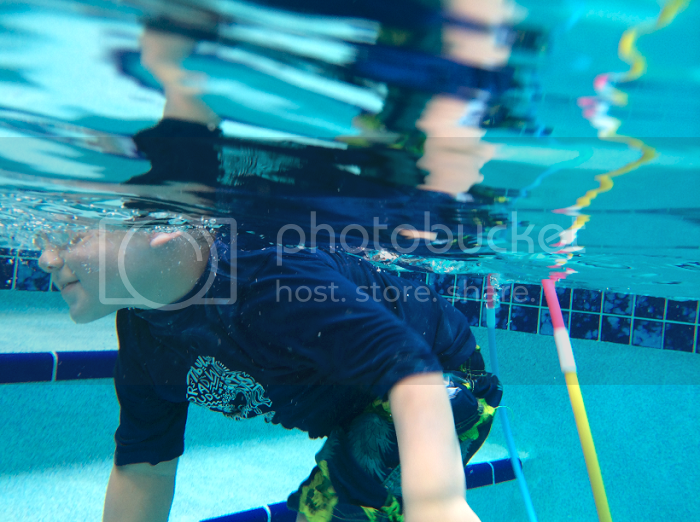 And for those of you, like us, who are still fitting in some summertime recreation after school, check out all of the great swim gear Swim Outlet offers!